Enter for a chance to win three games in one go. Welcome to our latest free Steam key giveaway. 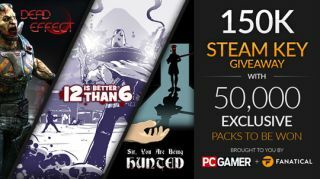 We're teaming up with Fanatical (formerly Bundle Stars) to give away 50,000 bundles, each of which contains three free Steam keys for the following games. To stock up your library even further, you can use the code FANATICAL10 to get 10% off most games in the Fanatical store before November 19. In the bundle you will receive Sir, You Are Being Hunted from Big Robot and PC Gamer alumnus of PC Gamer, Jim Rossignol. It's a chilling game about surviving on islands created by a 'British Countryside Generator', populated by of murderous top-hatted robots with rifles. You can also fight off hordes of zombies in the futuristic corridors of Dead Effect, armed with a host of upgradeable weapons scattered across a five hour campaign. Last but by no means least, 12 is Better Than 6 is a top-down hand-drawn cowboy shoot-'em up that calls to mind Hotline Miami. Vitally, you can indeed choose your cowboy hat. To win, simply follow the instructions in the widget below. Good luck!